Lyrita Audio extends full support for all its products, and to all customers. Though based at a single location in New Delhi, technical assistance is available by phone and email. Assistance is also available through a network of customers all over India. For repair and modifications to equipment, the units will have to be shipped to Lyrita Audio in New Delhi. Current product manuals, and schematics, are available here. 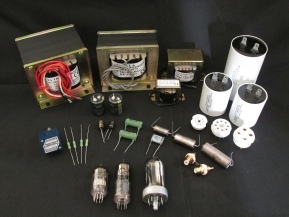 Some of the fine components that go into Lyrita’s amplifiers - Delta transformers and chokes, Samsung electrolytic capacitors, Elna Silmic capacitors, Advance high voltage film capacitors, ceramic tube sockets, gold plated RCA sockets, Alps potentiometers, Kiwame carbon resistors, Stead wirewound resistors, Russian K409-Y paper-in-oil capacitors, Russian silver mica capacitors, Russian input tubes.